The USB-C to VGA+LAN Travel Adapter is designed for extra connectivity demands. With the adapter, you can extend the connection of a computer to Ethernet network, and displays via USB-C interface. Feel free to plug in upside down for USB-C plug is reversible. 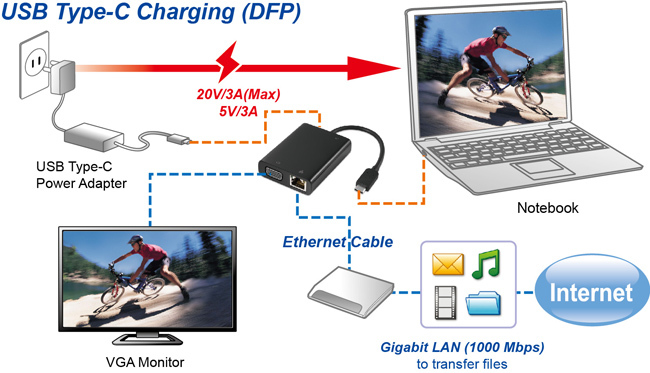 With VGA video output, the adapter enriches the user’s experience. The bus-powered design is convenient for travelers, and the self-powered design allows the user to charge via USB-C port. By including an RJ45 Ethernet port, gigabit network can be accessed through the adapter. Overall, the stylish, sleek and compact design makes the adapter your perfect solution for USB port expansion.